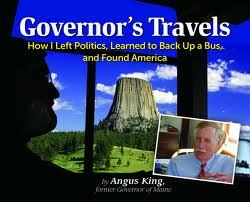 Click here for 13 full quotes from Angus King in the book Governor`s Travels, by Gov. Angus King. This book is a travelogue. It has all the usual things that a travelogue has: maps of the cross-country routes; goofy pictures of the wife and kids; anecdotes about favorite places. But THIS travelogue is by the former governor of Maine. He started his cross-country RV trip, with his wife (that would be Mary Herman, the former First Lady of Maine) and their two kids (who were home-schooled en route), the day after retiring from the governor's office. Angus King, the former governor of Maine and the author of this travelogue, is now the frontrunner for U.S. Senate, for the seat being vacated by Olympia Snowe in November 2012. Hence we looked over his book to find any hints of policy stances. We found a few; excerpted below. Obviously, a popular and freshly-retired governor will have some policy issues arise anywhere and anytime. But mostly this book is just a travelogue. We read it for the policy -- you might prefer to read it for the stories about the Corn Palace and the Tabasco sauce factory. It's much more fun that way. How are deficits suddenly cause for mass demonstrations? Windpower: everyone's for progress; no one's for change. Oil & trees aren't ours to use up in our generation. River "amenities" have enormous economic & cultural value. National parks are tax money well spent. Two Maines: inexorable decline of rural areas. Get cars out of the more crowded national parks. States Rights: code for 1840s slavery; & 1950s segregation. Learned lessons of retirement by travel after governorship. Greatest documentary ever: Ken Burns' "The Civil War". Regret the things you did; rather than things you didn't do. Internet approaches economists' ideal of a perfect market.